Are you interested in directing a show for OHMPAA? We generally send a letter to directors in the spring, asking for show submissions for the following season. If you aren't already on our mailing list, please send an email to the address at the bottom of the page and we'll get back to you. Every year we consider musicals and non musicals to fill our season. We ask potential directors to send us a list of shows they would be interested in directing in order of preference, and their choice, if any, of a time slot. We ask that each submission include a brief description of the show, cast size, and any other pertinent information that would be helpful to us, such as a complicated set, technical challenges, simple costumes, etc. Upon receipt of the suggestions from all interested directors, the OHMPAA Advisory Board will appoint a reading committee to create a recommendation for the next season. Our goal is to have the season selected by September. Please send your selections to either ohmpaa@gmail.org or OHMPAA, PO Box 131, Norway, ME 04268. If you have any questions, concerns or suggestions, please do not hesitate to contact us (see below). 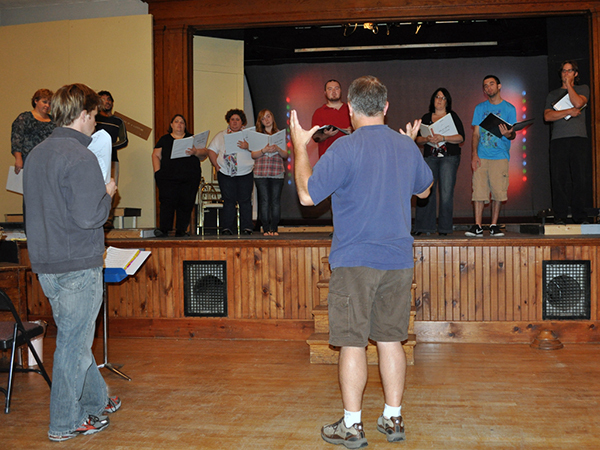 Norman Hutchins and Jeff Orwig work with the cast of Roles of a Lifetime in 2010. 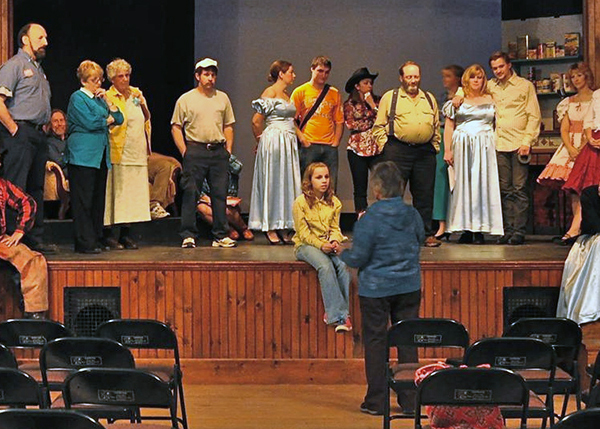 Sally Jones directs The Road to Eden's Ridge in 2012.